We'll be using the "raster" package, and you should put the additional WorldClim data into your "WorldClim" R project folder. You should extract the mean, min, and max temperature files into separate folders, e.g. ../WorldClim/wc2.0_30s_tavg/, ../WorldClim/wc2.0_30s_tmin/, ../WorldClim/wc2.0_30s_tmax/. If you have a different folder setup, you should amend the code below (e.g. replace ../ with your file path). The second part of the code t.mean <- stack(t.mean.files) creates the RasterStack object from the list of files in "t.mean.files". If you were to take a look at the "t.mean" object in the R console, you would see it has an additional "dimension", nlayers, with a value of 12. These layers are the individual data files from the list you created ("t.mean.files"). You'll also notice that the "names" attribute is automatically populated. Lets rename these layers to something more useful. In the previous guide we extracted data for our sample sites from separate RasterLayers, and "built" a data frame using separate commands for each month. With a RasterStack, it is possible to extract all the data using a single command. The data frame should now contain mean temperature data for your samples sites for every month. If you compare this data frame to the one we created in the previous guide, you'll see it contains the same data, but it was much easier to create. In the previous guide we subsetted the individual RasterLayers to a smaller geographical area, and we defined the extent() using coordinates we input. It's also possible to define the extent using another object, rather than typing in the coordinates, for example, using the outline of the country we want to subset data for. Lets use the outline of Morocco to define our extent. First, we need to get the data from the Global Administrative Areas (GADM) database. You can do this using a command within R.
This code will automatically download a "SpatialPolygonsDataFrame" to the R working directory, which contains an outline of Morocco. The country code refers to ISO-country codes, and you can find a list here, either the two or three letter code should work. You could plot this object to confirm you have the right country: e.g. 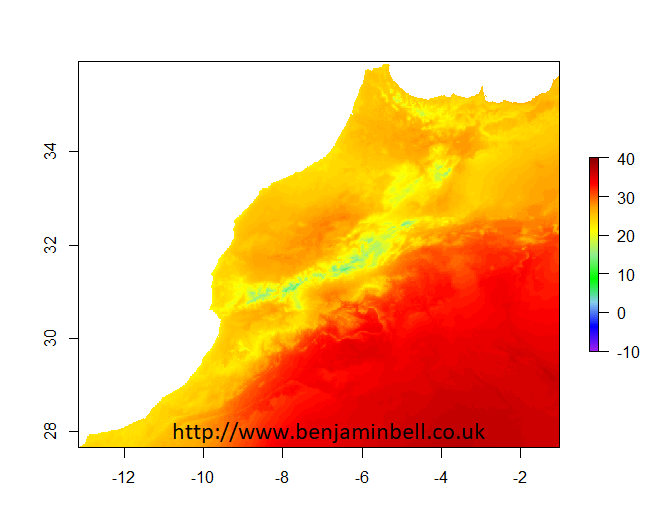 Now, to subset the data, you simply define "Morocco" as the extent() and then crop() the RasterStack object. Note that the number of data points, the extent, and the min/max values have all changed from the larger "t.mean" object. When you plot a raster object in R using plot() the command is sent to the plot() function contained within the raster package, rather than the standard plot() function which is part of the default "graphics" package. To see what I mean, type ?graphics::plot and ?raster::plot into the R console, which will invoke their respective help pages. R is smart enough to know what type of object it is that you are plotting and sends it to the correct function automatically. Hence, why you do not need to use the full command raster::plot(ma.t.mean) when plotting your raster objects. Why is this important? Well, raster::plot() contains some additional arguments which you can use when plotting, that are not available in graphics::plot(). 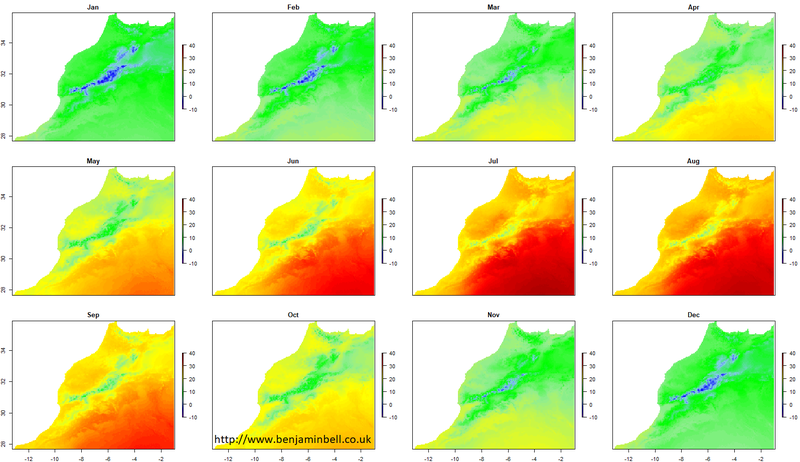 Lets plot mean August temperatures for Morocco. Because our data is now contained within a single multi-layer RasterBrick object, we have to specify which layer we want to plot for August temperatures. In the previous guide, we added the country outline, place names, and a title to the plot figure. You can do that using the same commands when plotting a single layer from a RasterBrick/RasterStack object. What if we also want to change the layout of our figure? When plotting "normal" objects, or a single RasterLayer, you would use layout() to control the layout of the plot window. For multi-layer raster objects, you instead control the layout within the plot() command itself using the arguments nc= and nr= which define the number of columns and rows respectively. e.g. Have a look at the help page ?raster::plot for all the plot options available and experiment with your plots. 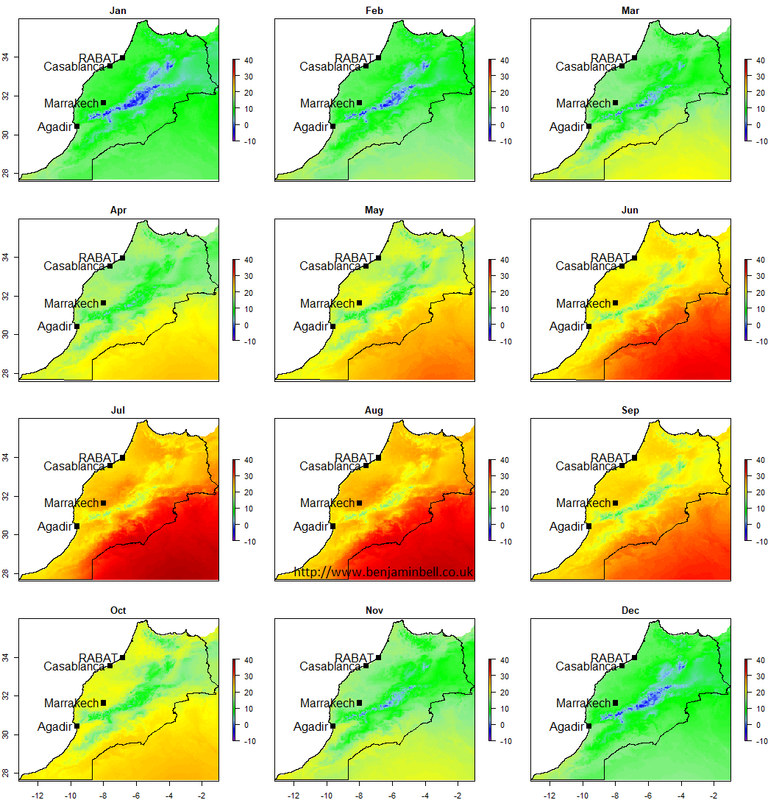 Lets create a figure that shows the coldest and hottest places in Morocco during the year. First, we'll need to create two new raster objects containing the minimum and maximum values for the year using the calc() function from the raster package. This code creates a new raster object, calculated from either a RasterStack/Brick (ma.t.min) or a collection of RasterLayers. The second argument in the code tells R what to calculate, in this case, the min and max values. Looking at these new objects in the R console, you can easily see the min and max values, which is useful to know when plotting to specify the scale. You'll also see that they are now a single layer RasterLayer object. In the plot we created earlier, it showed Morocco and Algeria. If you want to only show a specific area, e.g. 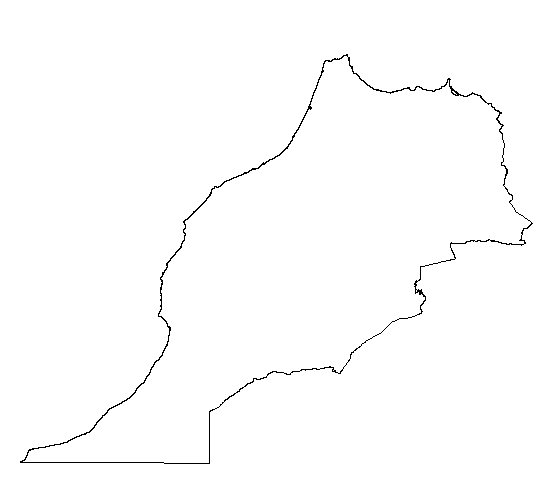 just Morocco, you can do this by masking the raster object to the country outline using mask() from the raster package. e.g. You can see that the masked object contains the same number of data points (ncell) as the unmasked object (ma.t.MIN). However, since the values outside the mask have been changed to NA, when you plot the mask, you'll only see Morocco. mask() is also useful if you want to do data analysis for a specific area or region on the map. To demonstrate the differences between the two objects, let's convert them to a data frame, remove the missing values, compare the number of rows in each data frame, and calculate the mean values. First, convert the masked, and unmasked raster objects to a data frame - we'll just use the min temperature data for this example. You can see that in fact the masked object has significantly fewer data points (containing actual data) than the masked object. Finally, lets calculate the mean minimum temperature values for each object. Looking at the masked object, we can see that Morocco has an average minimum temperature of -2.3 ℃, compared to -2.6 ℃ for the wider area. Using this technique, you could for example, also calculate the average maximum temperatures for the entire country to know the average temperature range. We'll come back to using mask() in later guides. 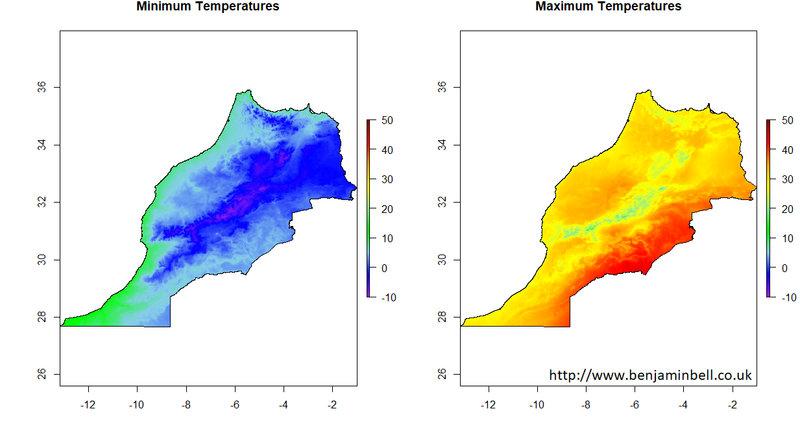 Back to our minimum and maximum temperature map for Morocco, lets go ahead and plot this! Because these objects are RasterLayers, we'll have to use layout() to setup the plot layout. Masks can be useful if you want to highlight a specific area. E.g. you might want to create a map that shows climate data for only certain States in America. Or, like in the above example you want to highlight one specific country. Lets add the countries surrounding Morocco to our map - we'll just plot maximum temperatures this time. Firstly, we need to download the additional country outlines from the GADM database. Why don't we just use the "world" outline from the "maps" package as we did in the previous guide? Well, the resolution of that outline is much lower than the individual country outlines, so will not look as good. Next, since the extent for the "ma.t.MAX.mask" object is limited to Morocco, we'll first plot a dummy plot with a bigger extent. 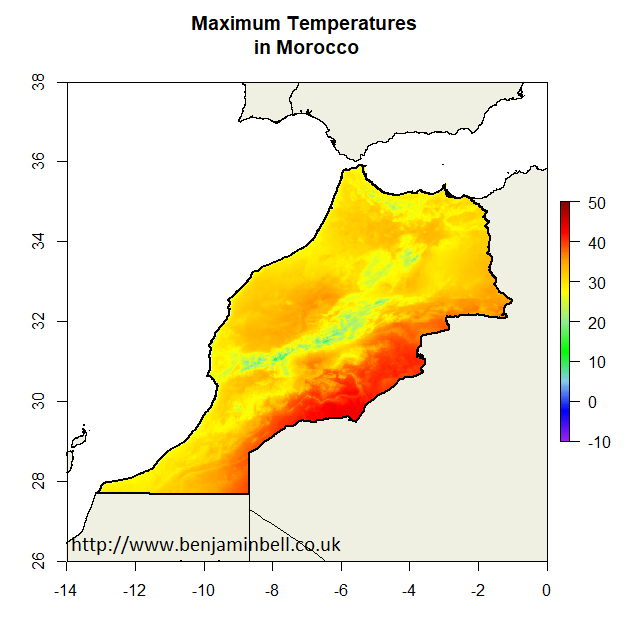 We'll then plot our max temperatures raster of Morocco, and additional country outlines. However, before we plot the additional countries, we need to first set the clipping clip() region for our plot to match the coordinates defined in the dummy plot. If we skip this step, then the additional countries will be plotted outside the main figure. Thanks for reading! As ever, if you have any comments of questions please leave them below. Extracting Worldclim climate data - Downloading, extracting and plotting WorldClim data - using RasterLayers.